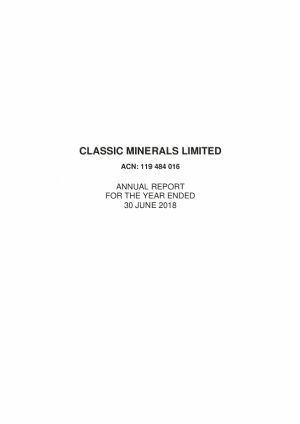 The directors of Classic Minerals Limited (ASX:CLZ) submit herewith the financial report for the financial year ended 30 June 2018. 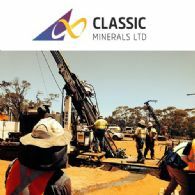 Classic Minerals Ltd (ASX:CLZ) provides the Company&apos;s Prospectus. 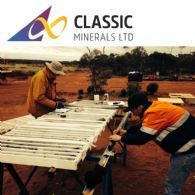 WA-focused gold exploration and development company Classic Minerals Limited (ASX:CLZ) is pleased to announce that it has received assays results from its recent RC drilling program at its Forrestania Gold Project in Western Australia. 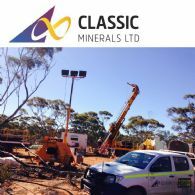 WA-focused gold exploration and development company Classic Minerals Limited (ASX:CLZ) is pleased to announce that it has completed its latest drilling campaign at its Kat Gap project which is part of the Forrestania Gold Project in Western Australia. WA-focused gold exploration and development company Classic Minerals Limited (ASX:CLZ) is pleased to provide an update on its exploration targeting strategy at its Fraser Range Nickel-Copper-Cobalt project in WA. 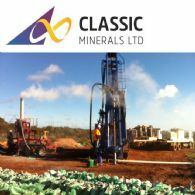 WA-focused gold exploration and development company Classic Minerals Limited (ASX:CLZ) is pleased to announce that it has commenced RC drilling at its Forrestania Gold Project in Western Australia. WA-focused gold exploration and development company Classic Minerals Limited (ASX:CLZ) is pleased to announce that it has successfully completed a Placement to raise $1.8 million before costs. The raising received significant demand from new domestic and international shareholders and was managed by leading Perth and Sydney-based stock broking firms. 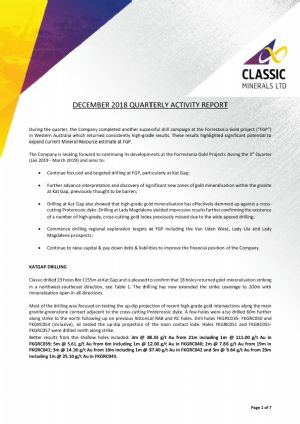 During the quarter, Classic Minerals Ltd (ASX:CLZ) completed two successful drill campaigns at the Forrestania Gold Project in Western Australia which returned consistently high-grade results. These results highlighted significant potential to expand current Mineral Resource estimate at FGP. 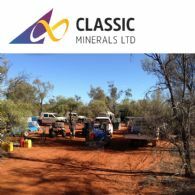 WA-focused gold exploration and development company Classic Minerals Limited (ASX:CLZ) is pleased to announce that it has entered into an innovative agreement with Australia&apos;s national science agency CSIRO to investigate the relationship between tree size and gold mineralisation at its Forrestania Gold Project in Western Australia.